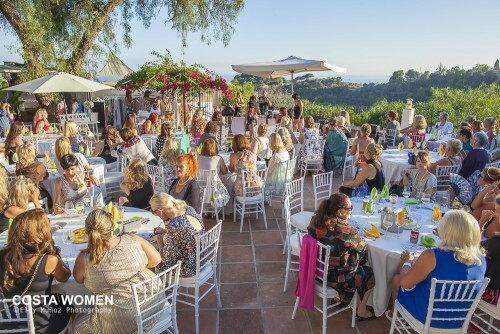 On Thursday 25th June, nearly 90 members of Costa Women celebrated their 4th Summer Party at The Courtyard Marbella for an evening of music, summer styling and fund raising. The ‘House Hairdressers’ award winning UK hair stylists Anita and Thomas and the team from their Elviria salon gave a mini workshop about summer hair. Professionals from Mary K provided insights into using their makeup brand. SpecSavers Opticas enabled Costa Women to join in with their “Specsavers Wearer of the Year” competition by using their mobile photography booth. The summer setting was filled with sunflowers and music provided by Daniel Boland and Laura Elen The evening, which was sponsored by Caser Seguros, raised 1,660€ for Fundación Cudeca.